Amazon Echo speakers, powered by the Alexa voice assistant, are a glimpse into a hands-free future, one in which our every command is handled by some disembodied helper and its legion of robotic household minions. Watch as evolution turns our hands into wasted hunks of meat and muscle, devolving over the coming millenia into little more than smart-ring wearing trotters. That future, however, isn’t quite with us yet - there's still a place for touch to help you control your smart home. That's where the redesigned Echo Buttons come in - and they're now much more worthy of parting with cash for. 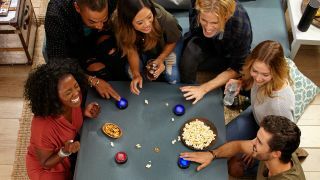 Though originally the Buttons were designed to be controllers for audio-and-voice party games, a new update has greatly expanded what the devices are capable of, which is the main reason we now feel confident to recommend them. Using the Alexa app, the Echo Buttons can now be programmed to control multiple smart home devices at once, letting you build up routines to instantly set a scene with just a tap. Want your lights to switch off, your doors to lock and your thermostat to heat up all in one go? A programmed Amazon Echo Button can now let you do that, or any other combination of Alexa-compatible features. You’re only limited by your connected gear and your ingenious imagination. What is an Amazon Echo Button? Echo Buttons connect to your Amazon Echo devices and give you a different, easy and fun way to play games and control skills. They unsurprisingly look like big buttons and measure 75mm across, making them big enough to press in a hurry but compact enough to sit on your coffee table. You can connect up to four buttons to each of your Amazon Echo gadgets via Bluetooth and the whole Echo range is compatible, whether you've got a Plus and the Spot or the Show and the Dot. Powered by a pair of triple-A batteries, they glow different colors depending on the role they’re currently taking on. Amazon currently offers up more than 75 different Alexa gaming skills that you can use the buttons for, like Trivial Pursuit, Guess The Logo and Would You Rather. It's not just about fun and games though, as Echo Buttons can be practical and trigger commands such as playing music, turning off lights or telling the family dinner is ready. You can easily customise the uses of your buttons from within the Alexa app. Yes – there are plenty of smart switches out there, but the majority of them are purely for triggering smart lighting - the Philips Hue Tap for instance. The Amazon Echo Button stands apart by being able to run entire smart home routines from a single button press – and doing so without breaking the bank. If there’s a drawback of the Buttons though, it’s the fact that they’re solely battery powered, If you become reliant on their programmed routines and find that they’ve run out of battery overnight, you’re going to have to get chatty with your home all over again. Should I buy an Amazon Echo Button before Black Friday? With little on the market to offer a similar function at such a low price, we’d say the time is now right to buy an Amazon Echo Button. In fact, the timing of the update seems very fortuitous. With Black Friday just around the corner, and the Amazon Echo line-up being at the heart of Amazon’s deal offering every year, we’d expect to see the Echo Buttons making an appearance of some sort. Working solely within Amazon’s Alexa ecosystem, and at loss leading prices, we’d imagine these will get a slight discount, or will become bundled in with the smart home accessories that they’ll be able to control. In that respect you may want to hold out to see what deal season brings. But as an affordable additional option for controlling your smart home, they’re well worth a try, and a great way of getting those not comfortable with a connected home familiar with their interactive capabilities.